The contamination of the rotavirus vaccine Rotarix with porcine circovirus 1 DNA was revealed by deep sequencing. The same technique was also used to demonstrate that oral poliovirus vaccine does not contain viruses that can cause poliomyelitis. 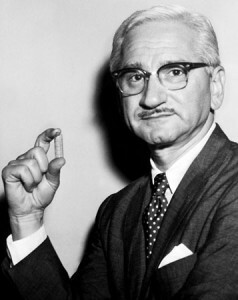 The oral poliovirus vaccine strains developed by Albert Sabin (pictured) were licensed in the United States in 1962, and over the next 37 years immunization with these vaccines lead to the eradication of poliomyelitis in this country. During that period, the vaccine was responsible for 5-10 cases of poliomyelitis each year, either in recipients of the vaccine or in their contacts. Some of these individuals have sued the manufacturers of the vaccine, claiming that they made a defective product. OPV contains three different poliovirus strains which were selected by Sabin because they do not cause poliomyelitis. We call such vaccine strains avirulent or attenuated. The mutations in the genetic information of the virus that prevent the development of paralysis have been identified. Unfortunately, these mutations are unstable. After oral administration, OPV replicates in the intestinal tract. During this phase the vaccine viruses undergo genetic change and eventually lose the mutations that made them avirulent. As a consequence, nearly every infant who receives OPV sheds in the feces polioviruses that are significantly more neurovirulent than those that were ingested. Vaccine-associated poliomyelitis is caused by vaccine revertants that accumulate in the alimentary tract of immunized individuals. These neurovirulent viruses arise not because the vaccine is improperly prepared, but as a consequence of mutation during replication in the intestine. Proving this point to lay juries has been difficult. Now deep sequencing of poliovirus vaccine can show whether or not vaccine preparations are contaminated with neurovirulent viruses. Deep sequence analysis of OPV manufactured by Bharat Biotech was done to detect mutations associated with neurovirulence. There are four mutations in the genome of type 1, two in the genome of type 2, and three in the genome of type 3 that are important for the attenuated property of the vaccine. 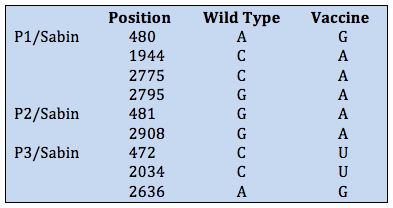 The base present at each of these positions in the neurovirulent wild type viruses, and in the vaccine strains, is shown in the table. The results of sequence analysis show that the Bharat vaccine does not contain any of the ‘wild type’ bases at these nine positions. Any vaccine-associated poliomyelitis associated with this vaccine is not a consequence of faulty production, but the fact that vaccine strains mutate during replication in the human gut. There have been many lawsuits involving vaccine-associated poliomyelitis in which plaintiffs claim that the OPV was incorrectly manufactured, leading to a product of unacceptably high neurovirulence. Deep sequencing analysis of these lots of vaccine could have resolved this claim in a way that a lay jury could understand. Would it beenefit or harm if the population was explicitly made aware of this information prior to vaccination? In the scenario you describe for polio vaccine, I'm pretty sure that 5 to 10 people a year would lean very strongly towards truly informed consent before vaccination. As for the balance of the population, I'd like to know but how many people would decline vaccination and get (and then spread) polio? Earlier posts have talked about the credibility of science within the general population. Any thoughts on truly informed consent and easy to understand explanations for patients before being vaccinated? To a lay-person, it does not make much of material difference if the original vaccine preparation already had virulent virus particles, or it merely contained virus particles that could mutate to become virulent. Are there efforts to make the mutation that make the vaccine avirulent more stable? This is precisely the reason that Dr. Racaniello's (and his colleagues) basic research is so important. Understanding the nature of these mutations, how they work in concert with each other, and how they revert is no small feat. Keep in mind how incredibly safe vaccines are compared to the alternative: how many people do you know in iron lungs today? We'll always strive to make it safer but there will always be some measure of risk. Going from tens of thousands of cases/year to 5-10/year from the vaccine seems like a pretty good trade off to me. Everyone would love zero but it might not be biologically possible, and no one should demand zero risk. Cars continue to kill quite a few more people than vaccines but most of us continue to accept this risk. And, unlike cars, there is no consequence of not using cars (well, except that it will become pretty hard to get anywhere). Injectable polio vaccine has inactivated virus, so there is no possibility of the vaccine reverting to a more virulent strain in the body. In the US, only injectable polio vaccine has been used since 2000. So I would say that this problem has been adequately adressed by changes in the type of vaccine used – in the US, and many countries in europe at least. Unfortunately, the IPV (inactivated poliovirus vaccine) does not give as strong of an immune response as the OPV (oral poliovirus vaccine) – especially for secreted IgA antibodies which may be very important for polio immunity. This isn't as much of a concern for polio-free countries, but in areas of the world where polio is still endemic – the added immunity received from OPV may be very important. Also, OPV can be administered without trained medical personnel, which makes the massive polio vaccine administration fiscally feasible in countries like India. We know that attenuated poliovirus can be implicated in VAPP cases, but what about transverse myelitis, which is considered to be a host mediated immune response gone wrong. From my understanding wild poliovirus can cause transverse myelitis, but it seems that the scientific community is sceptical about the vaccines ability to induce transverse myelitis. My colleagues and I investigated such a case, http://www.journalofclinicalvirology.com/articl… , and would be genuinely interested in your opinions, as I have been engagd in heated arguments about the vaccines role in this condition with other colleagues. Why not vaccinate with inactivated polio virus first and follow up with OPV. The inactivated virus should be able to stimulate a systemic immune response which would prevent significant systemic replication of OPV that is given at a later time, and therefore lessen the chance of reversion to virulence. The purpose of the OPV used subsequently would be to stimulate IgA mediated mucosal immunity, if the inactivated vaccine had failed to do so initially. Not sure how practical it would be, but theoretically it sounds like it might work.